Meet Saffron. Her mum is an artist who says 'darrling' all the time, her little sister Sage has an unquenchable appetite for asking annoying questions, and her dad is always travelling on business to bring home the bacon. 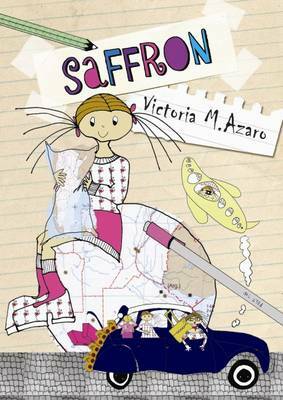 Saffron goes travelling too, usually with her mum and Sage... read full description below. Meet Saffron. Her mum is an artist who says 'darrling' all the time, her little sister Sage has an unquenchable appetite for asking annoying questions, and her dad is always travelling on business to bring home the bacon. Saffron goes travelling too, usually with her mum and Sage. And she has an uncanny knack for getting into difficult situations. Join her as she dodges traffic in Buenos Aires, eats escargot in Provence, and gets lost in a Mass Transit Railway station in Hong Kong. Saffron is a joy to read. Quirky, hilarious, irreverent and spirited, it will be loved by parents and children alike. Azaro captures the voice of the child perfectly, while her unique illustrations are full of energy and humour.